Q: What do TFM Page, Forum Hub and Hub mean? TFM Page is the No.1 portal for tamil film music. Forum Hub (sometimes called old hub) is a discussion site hosting forums on many topics. 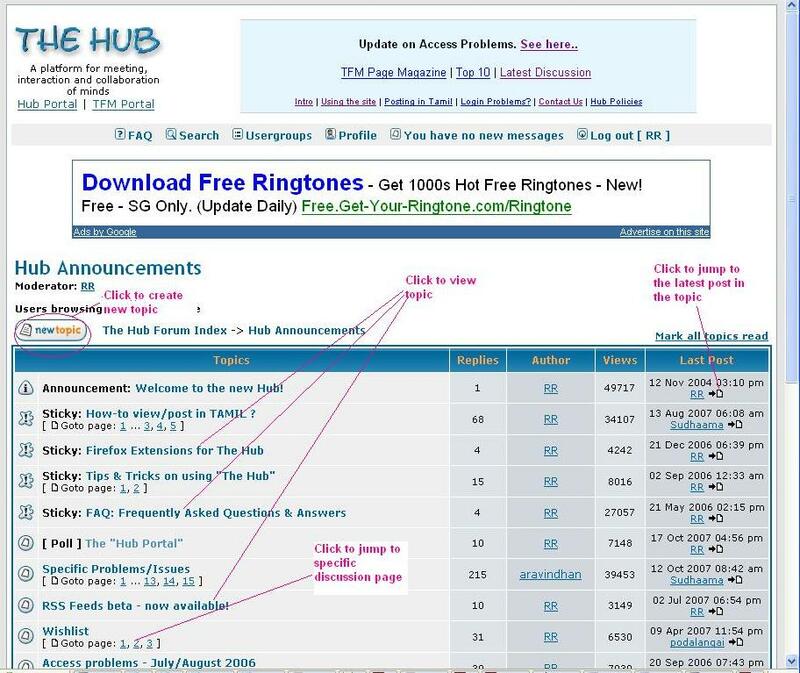 Hub (the new Hub) is the phpBB platform on which the forums from TFM Page and Forum Hub are co-hosted. You can visit the Hub or the respective sites TFM Page and Forum Hub (where the topics are mirrored) to read the discussions. Q: Do you have quick instrucions for 'Getting Started' ? Forum Hub users, see here. TFM Page users, see here. After you enter a forum, you'll see a page similar to this. Go thru to understand the main buttons/links. After you click on a topic, you'll see a page similar to the one below. Go thru to understand the main buttons/links. Q: I registered by still cannot login. Why? After registration, did you get a mail titled "Hub Account Activated'? If not, your account is still awaiting activation. (If yes, go to next Q.) It may take a while to get this done. If you want this done IMMEDIATELY, you can reply to the 'Welcome' mail you received when you registered and request so. Remember to mention your userid and preferably which forum/thread interests you. Q: I changed my email, and now I can't login. Why? All email changes go thru activation, so you have to wait. For quick activation, pls alert 'Admin' by replying to 'Welcome' mail. Q: I got the 'Account Activated' mail, but still cannot login.. Why? 2. Click 'Forgot Password' (below Login) and do a password reset. A new password will be mailed to you. Q: I still cannot login. What to do? Reply to the 'Welcome' email and request for help. Remember to mention your userid & the error you received during login. read the basic instructions on posting, editing, private message-ing, etc..
Q: Where can I make test postings? Q: How can I read the most recent posts? If you are logged in, go here. If not logged in, just click on "Latest discussion" in the top banner. Also see here for Forum Hub topics and this for TFM Page topics. Q: Can I get updates for specific topics? Visit the topic you are interested in. Scroll down and near the bottom left, you'll see a link 'Watch this topic'. Click it and you'll receive notifications whenever the topic is updated. Q: How to post images? Due to frequent abuse, posting inline images has been disabled. However you can post a link to an image, and request moderators to enable display. Pls note that image display will be activated only post-wise after moderation. If you have the image on your PC, you can upload to free image hosting sites (e.g. http://www.photobucket.com) and obtain a link. Q: What if I have a video or other files that I want to share? You can try free hosting services like http://www.youtube.com , http://www.yousendit.com/ , http://www.savefile.com . Or, you can also send it to admin (see 'Other questions' below for email) who will host it for you. Q: Can I obtain a link to a specific post? Yes. Here's how to grab the link. First, go to the post you want to link. At the very beginning of the post (before the content), you'll see a small paper icon followed by 'Posted: ' and then the date & time. Place your mouse on the 'paper icon', do a right click and select 'Copy shortcut' (In Firefox, it is 'Copy link location'). Now the link is in your clipboard. You can 'paste' it anywhere..
Q: I copy&paste-d text and posted my response, and my post content is ok but it displays in strange fonts, why? This happens due to a windows quirk. To fix it: Before submit, mark the entire text in your post (using the mouse), apply 'Font face' and select 'Arial' font. Now preview and see if it looks ok and then submit. Click 'contact us' on the top banner and send your query/feedback by email. We'll address it at the soonest. 1. For more questions: either pm or email me . Hello.Thats a good one ! All times are GMT +5.5. The time now is 01:53 PM.